Kids (and adults) LOVE it ! 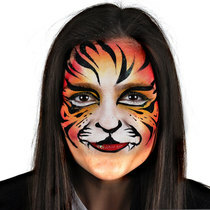 Let the 'magic' of face painting enrich children's play and imagination. Just watch as they transform into their favourite character..you will smile and laugh with delight ! Face painting is a unique, expressive art form that holds a special place in a child's heart. We love what we do and take pride in our art, paying special attention to detail. Making each child feel special is important to us. We provide our own set up, ready to surprise and inspire happy faces and create delightful lasting memories. As a guide..please allow 1 hour to paint between 10 - 12 full faces for private parties. For busier events we can provide fast, fun designs.